For the Number Geeks! The numbers are in! By the end of 2013, I will have read 169 titles: read 38,482 pages and listened to 370 hours of audio. Impressive, but what does it mean? The numbers, after all, are arbitrary in value and don’t speak to quality or impact. So this: The numbers only mean that I read more than I did in 2012. That’s it! I had an outstanding reading year in 2013: 169 titles, 38,482 pages and 370 hours of audio! This was a personal best and I look forward to 2014! That said, it may surprise you that my goal for 2014 is actually to read less! I want to see more plays, more movies and do more hiking and kayaking! This is not to say that I am foregoing reading, only that I want to see more of the world beyond the page! I. New Releases – Books Released in 2014: Of necessity, this will category will be left open as the year rolls out its books. Many of my choices will be informed by the Blogger’s Recommend Newsletter and by what catches my eye from the Hot of the Press shelves at my library. VIII. From 50 – I want to have tackled at least 50 books form my TBR stacks. These will be books that I have purchased prior to January 1, 2014, will not overlap with any other category, and will NOT include ARCs. This will be something of an open roll as the other categories are completed first. X. Armchair Audies – For the past couple of years, I’ve been participating in the Armchair Audies. The Audies are the audiobook industry’s version of the Oscars. Particpants in the Armchair Audies listen to all the titles listed in a particular category and try to predict the winner. Finalists won’t be posted until sometime in February. At that time, I will list the category/titles that I have chosen. There are usually five audiobooks listed for each category. Owing to the heavy listening schedule already in place (owing to another group/challenge), I decided not to push my luck by plumping this list out to fourteen titles. 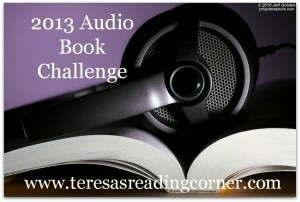 Teresa (@teresasreading) hosts the annual audiobook challenge at her blog, Tersea’s Reading Corner. There are five levels to the challenge: Flirt (6 audiobooks); Going Steady (12 audiobooks); Lover (25 audiobooks); Married (more than 25 audiobooks) and a [Create your own category]. I never got around to creating my own category, but I definitely read listened to more than 25!